It is with pleasure that I introduce you to Flatticus. Flatticus is the designer and fabricator of the rustication tool that I wrote about a few posts back. We met via Smokers Forums and also through the blog. We exchanged quite a few messages and emails back and forth over the past months on refurbishing pipes and in building the rusticator. Flatticus has been reading the blog for quite a while now and I have asked him to feel free to write-up some of his work for us to read. Flatticus is a great communicator and does some excellent work in his refurbishing. Without further ado I will let Flatticus introduce himself and this pipe that he has restored. Hi all, Flatticus here, an amateur to this wonderful hobby. This blog has taught me everything I know about restoration (but far from everything Steve knows, yet) and I’m excited to have a chance to share some of my recent efforts, all with methods learned right here at Reborn Pipes. I recently came across a large lot of pipes with some hidden gems, including this enormous Savinelli De Luxe 132 EX Pot. Even through the grime, it was clear at the outset that this was a beautiful piece of briar. 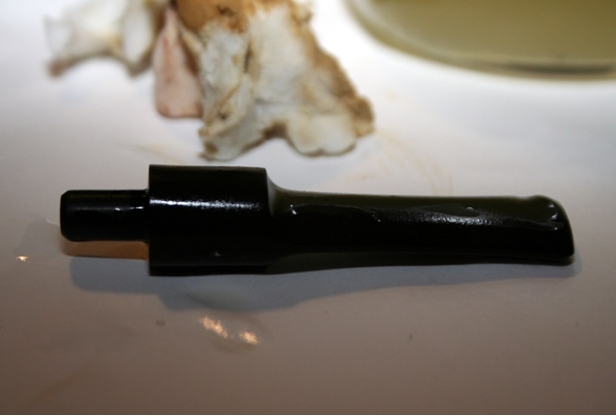 I was a bit hesitant from the outset, though, because I’ve never meddled with a pipe this nice. Still, there’s only one way to learn! 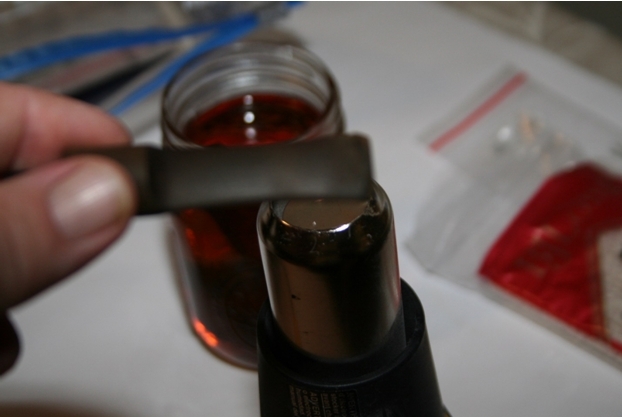 As you can see, the oxidation was extremely heavy, enough to hide the significant tooth damage to the button and bite zone. 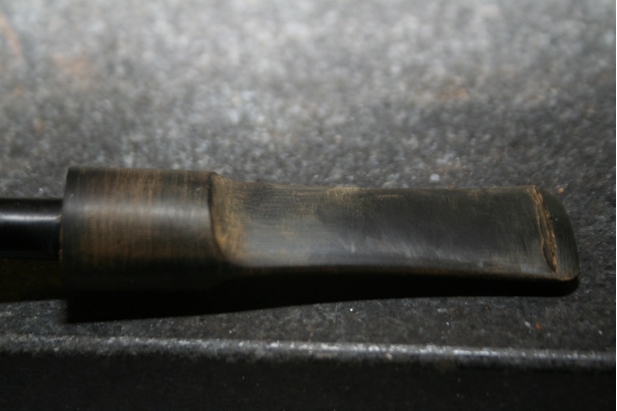 The pipe itself was grimy in the extreme, and while a touch of murphy’s oil soap took enough grime off to assure me this wasn’t heat damage, it wouldn’t touch the majority of the blackening on the pipe. First step, then, was to put the pipe in my alcohol bath, a technique I first read about in Steve’s post here. So I reamed the excess cake, and dropped it in the bath. The stem got a quick scrub with some pipe cleaners, and was already pretty clean, so into the Oxyclean it went for 2.5 hours. After the soak and a little scrubbing on with the Magic Eraser pads, actually bought as melamine foam on the cheap off eBay, but it’s the identical product, the stem looked great! At least unless you’ve read the recent post by Joyal Taylor here. Luckily, I had, so I knew to grab my trusty flashlight. 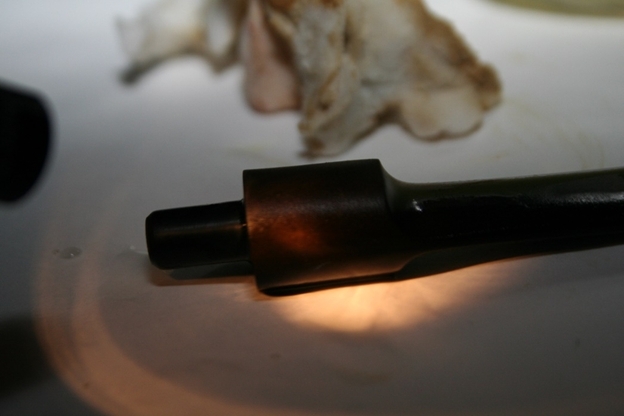 Oxidation was everywhere, and under an angled flashlight I could see it through the length of the stem. Ok, then I knew I had to sand. But first to address the bite marks. Step one was to try the heat gun, as I learned first here. Unfortunately the marks were too deep to come out completely from the heat, so I filled them with black superglue, a technique I found an in-depth explanation of, among other places on the site, here. In the meantime I turned to the stummel itself while the glue was drying. The bowl top was scratched pretty badly, and had some definite darkening to contend with. I knew I’d have to top it like Steve showed me in many posts like this one. I grabbed my topping board, actually a granite surface plate I bought from woodcraft years ago for lapping wood plane soles, and now use almost exclusively for pipes. 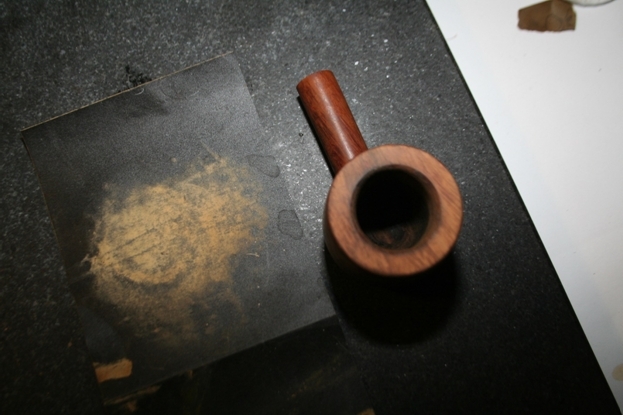 At 320 grit, my preferred poison for this procedure, the rim cleaned up quickly, but I soon enough decided that to eliminate all of the darkening I’d have to top the bowl lower than I liked. I came close, but left some of the color rather than lose the original shape. As you can see, the bowl was also a bit out of round (and still is, to a degree), which I went after with folder sandpaper to smooth out the curve without reshaping the bowl. 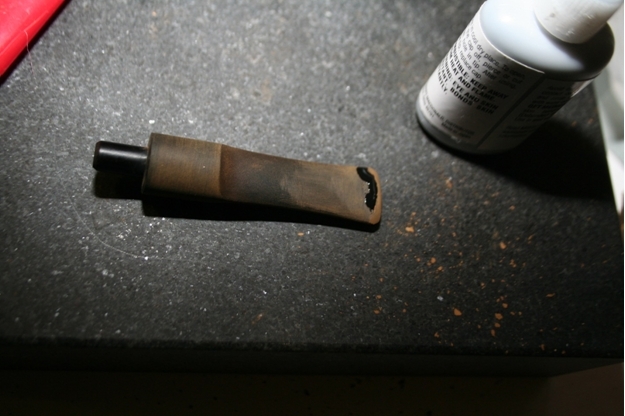 The pipe had 2-3 fills, but I was confident they’d blend into the stain. After this was done I gave the bowl one coat, applied twice with flame, of a medium brown Fiebing’s Dye, diluted to about 75/25 with isopropyl alcohol and set it to dry while I turned back to the stem. Unfortunately after a quick bit of sanding it was clear the stem needed more glue to be built back up, so I added some and tried to be patient while it dried. 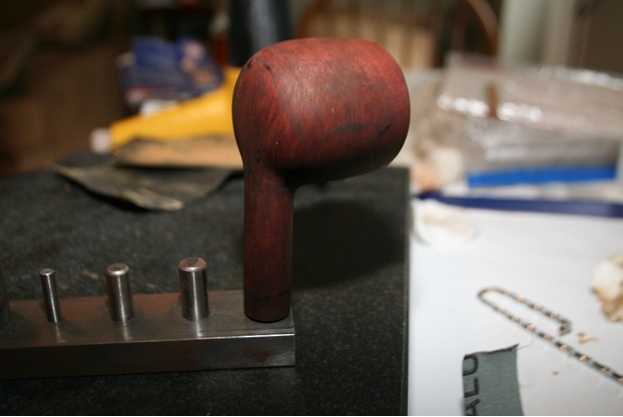 Once it had, I began sanding at 320 again, at this level with an eye towards shaping more than polishing. This is definitely a weak spot for me, so I’m glad for the practice, but I need more! After a lot of trial and error (mostly error) I finally had the stem shaped properly and sanded through 320, 600, 800, 1000 grit in sandpaper and the full range of micromesh pads from 1500 to 12000. It was looking nice and shiny, so I gave it a thick rubbing with obsidian oil and set it out to dry for about a half hour. At this point it was time to hit the buffing wheels. As you can see, I buff on the lathe, with a three wheel mandrel not made by Beall but suspiciously similar, and with tripoli, white diamond, and carnauba wax. One thing I’ll point out is that odd tool in the foreground, which is a wheel rake. 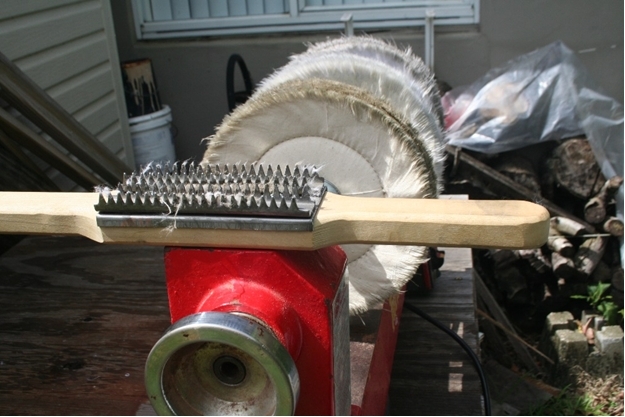 You can get the job done with a hacksaw blade, but if you want clean buffing wheels, these are hard to beat. After the three-part buffing, I chucked a 4” flannel wheel into my cordless drill for a final polish by hand. 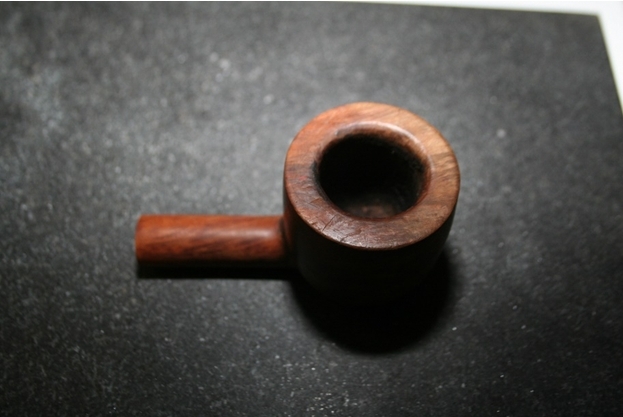 For a rank amateur, I must say myself, this turned out to be a very beautiful pipe. Looking back, I still have an awful lot to learn, that much is clear. For one thing, that rim fill didn’t blend quite as well as I was confident it would. All in all, though, I’m pleased as punch at having learned how to do any of this, and I have Steve and the great contributors to this site to thank for it. This entry was posted in Pipe Refurbishing Essays and tagged Alcohol bath, articles by flatticus, bite marks, Bowl - finishing, Bowl - refinishing, bowl topping, Bowls - refinishing, finishing, micromesh sanding pads, Oxidation, pipe refurbishing, polishing a stem, refinishing, refurbishing, removing oxidation, removing tooth marks, repairing bite marks, repairing bite with super glue, repairing tooth marks, restaining a bowl and rim, sanding a stem, Savinell De Luxe 132EX, Savinelli Pipes, Stem repairs, stem work on June 19, 2014 by rebornpipes. Great writeup with links! A newbie can learn a lot from this one article. End product looks great! Thanks, guys, and thanks Steve for the very kind introduction. I’m sure I’ve been called a “fabricator” before, but never in a good way. This was a lot of fun, and I can’t wait to do it again. Excellent work, Chris – that is a beautiful pipe. We all owe Steve much praise for all that he has taught us. You have learned well. Your end porduct came out beautiful, and your text, and pictures are outstanding. I look forward to your future post. Thanks for your contribution.